Groningen in the Netherlands has been described as the "World Cycling City" due to 50+ per cent of in-city trips being made by bicycle. With an extensive cycling network, good public transport services and a large pedestrian zone in its centre, the city is very favourable to people who wish to move around without a car. Cyclists in Groningen have a network of bicycle routes stretching almost 200km, the distance from the country's northern most city to Amsterdam. "All across the city, roads are being narrowed or closed to traffic, while short cuts for cyclists are created; we know convenience is vital so we have made it quicker to access the centre by bicycle than by car," explains Cor van der Klaauw, interviewed for the INDEPENDENT, and who co-ordinates municipal policy on cycling. "The number of cyclists is climbing steadily and we are aiming for a 70 per cent usage rate within the next decade. You have to enter into hot competition with cars, and that's what we successfully did here in Groningen," he says. 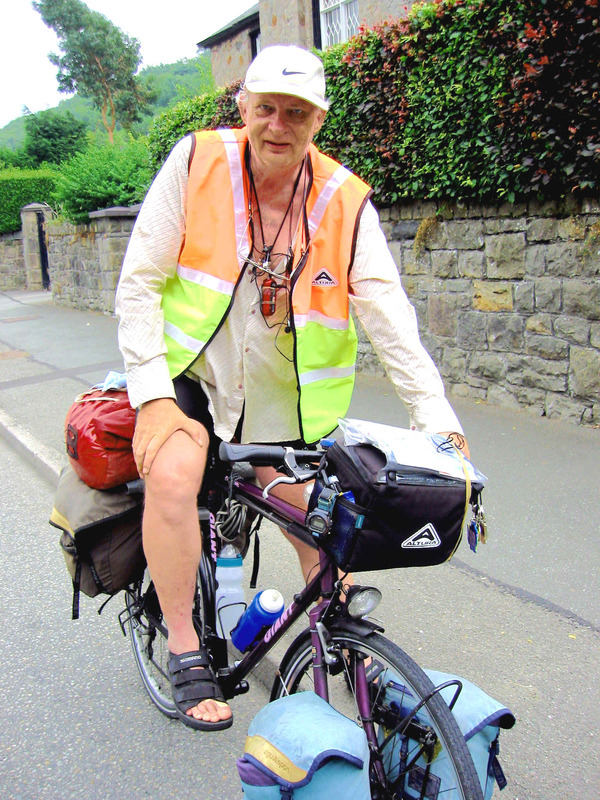 It is with such credentials as a resident of Groningen, that Jan Van Mildert, who teaches sociology in the city, set out at the beginning of July 2006 on a cycle camping tour of the UK. Three weeks into his tour, with several weeks still to go, your editor shared a brief duet of chuckling sprockets with him as he rode along the North Wales coast to Caernarfon from Bangor. He was heading in the direction of Penzance, but with no particular itinerary in mind. Asked about his experience of cycling on UK roads, his reply was an unequivocal, "Never again !". Arriving at the port of Dover he found motorists uncompromising and unprepared to give the clearance and respect he had come to expect in his home town. He quickly bought himself a florescent jacket, and found it much safer to leapfrog cities by train. Since arriving in the UK he's sampled Scotland and Northern Ireland. In the latter a car passenger threw a beer can, which lodged between his front wheel and a pannier bag. Fortunately he braked in time without mishap. He's also experienced verbal abuse and spitting from car passengers. For a short time he cycled with a fellow Dutchman, who he later learned had had to cut his holiday short after sustaining a broken collar bone from being hit by a car. Jan is making an audio diary of his trip, and plans to share his experiences with other Dutch cyclists via his local radio station. Let's hope the rest of his time in the UK will be more rewarding if he is able to plan his remaining routes more carefully, using minor roads. Like other long distance cyclists economising on weight and space, Jan is using small scale maps, which do not contain the details British cyclists favour. Perhaps that is contributing to his difficulties. Your editor is keeping in touch with him, so watch this space. I arrived home today; safe and in good health. After cycling in Wales I took the train to pass industrial Cardiff-Bristol on a safe way. Cycled a couple of days from Bristol to the south of England (e.g. visited Bath, a very beautiful town) and then took the ferry from Plymouth towards Roscoff in France. There I cycled along the northern coast of Brittany towards Rennes. Cycling in France is like being in heaven. Quiet and you are part of the traffic and respected. Has to do somewhat with the difference in cycling-culture between France and the UK, I think. Thank you for your good care! I took that cyclepath you advised me (Lon Eifion) after staying at the camping site at Hendre Farm (Caernarfon). Very lovely track and enjoyed it very much! But where did it end? It took me 3 minutes to cross the A-road and then was in dense traffic again (Bryncir). But there are other European cyclists finding the UK more to their liking - not least of all, Wales. 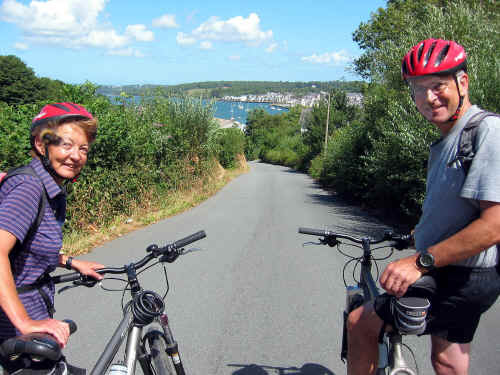 We feature below two couples who have chosen to use established and selected cycling areas, as compared to Jan, who has travelled randomly through both rural and urban areas. 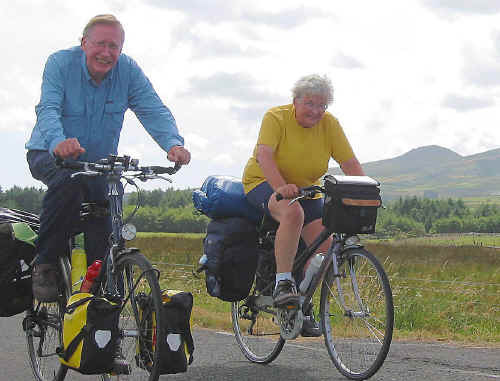 Mieke van Beurolen and Hans van Tol from Zoetermeer, Holland, are both familiar with cycling in the UK. Here they are photographed approaching Caernarfon from Criccieth along Lon Eifion, (Route 8 of the National Cycle Network). They too are selective in planning their holidays in the UK. In April 2006 their home city of Zoetermeer received a special mention in the European Mobility Awards for its coherent cycling strategy as part of a sustainable transport policy. CLICK here.